This photo is reputedly from the catacombs, but I can't verify its origin. The symbol is said to appear rarely in the catacombs, only in the catacomb of Priscilla and the atrium of the Capella Graeca (Greek Chapel).1 It was popularized in the fifteenth century, however, by Franciscan disciple Bernadine of Sienna as a symbol of peace. In 1541 St. Ignatius Loyola adopted the symbol with three nails below and surrounded by the sun as the seal of the Jesuit order. Contrary to some authors, the monogram originally stood for neither for Iesus Hominum Salvator ("Jesus Savior of Men") nor for "In His Service." Some attribute its origin to Constantine's vision, where he saw a cross with the inscription "In hoc signo vinces" ("in this sign you shall conquer,"2 which is abbreviated, according to them, as IHS. 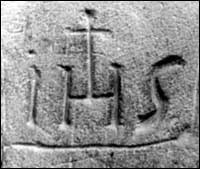 However, this seems to require a stretch, as do claims that it is really a pagan symbol.3 The simplest explanation, as an abbreviation of Jesus' name, is best. A. Hauck, Jesus Christ, Monogram of, The New Schaff-Herzog Encyclopedia of Religious Knowledge, Vol. 6, p. 168. Eusebius, The Life of Constantine 1.28. Matthew Baldwin, IHS a Greek abbreviation, B-Greek List, 16-Dec-2003.